SPECIFICATIONS: In northeastern Montana there is a family we have become friends with in the last couple years - an when it comes to ranching they are the real deal. 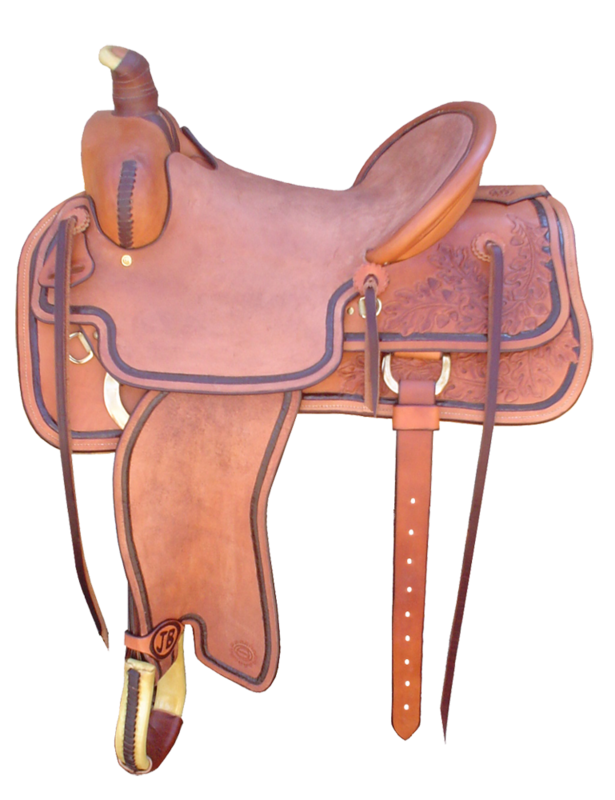 We built this saddle for "Mom" making sure it was tough enough for everday ranch work, fancy enough for the show pen, and not to cumbersome to throw atop a horse. 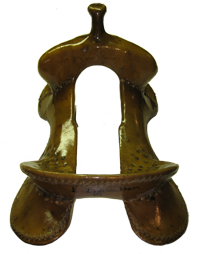 This saddle features 25 hand carved flowers and greenery and a beaded border througout. It has just enough carving to be fancy but its not overwhelming. 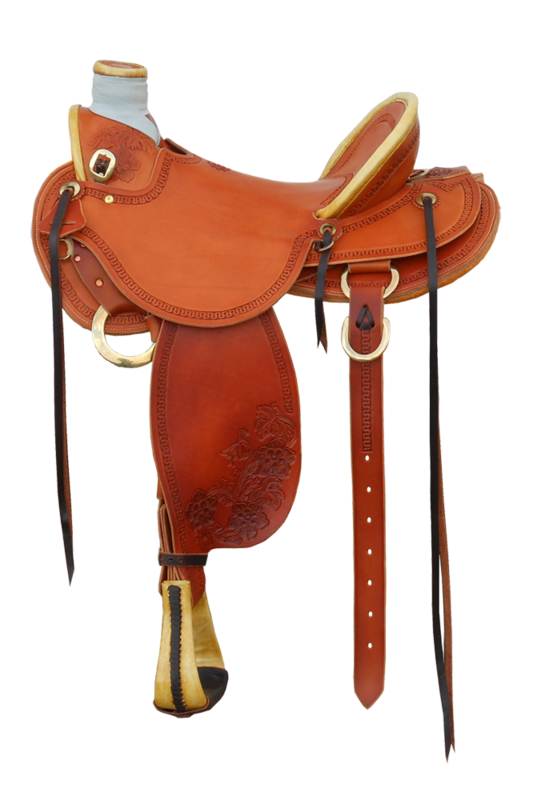 It has an in skirt rigging, features Wickett and Craig russet skirting leather, stirrups by Aaron Fandek and Jeremiah Watt floral hardware and conchos. 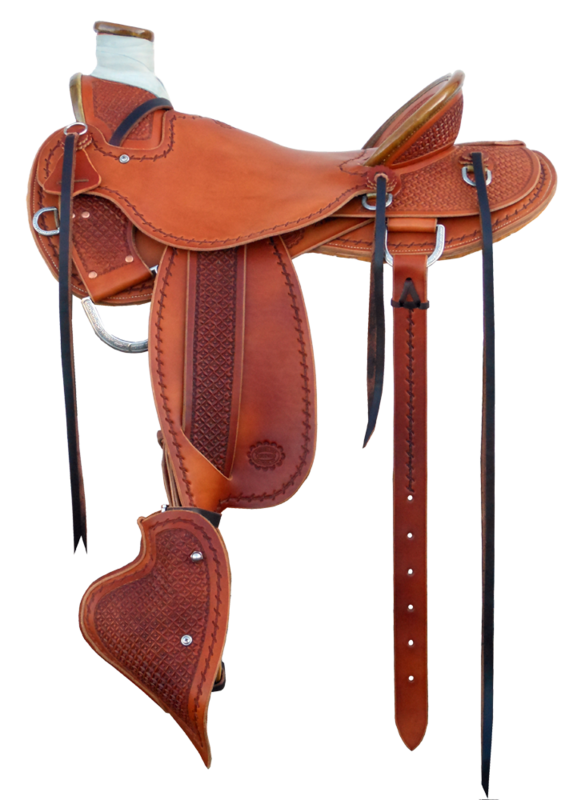 SPECIFICATIONS: This is a truly special saddle for us! Designed for Clara (2 1/2 years old) by her "Papa" better known around here as Zach and built by her G-Pa, known around here as Mike. This saddle is hand stamped with a brand new design from Barry King featuring a daisy in the center of traditional waffle stamp and wrapped in a hand carved beaded border. Rough out seat and fenders as well as tapaderos were used to ensure the safety of this young rider. The buck rolls can be removed as Clara grows and her skills improve. Russet skirting from Wickett and Craig, Natural Rawhide and Bork White Bronze hardware were used throughout. 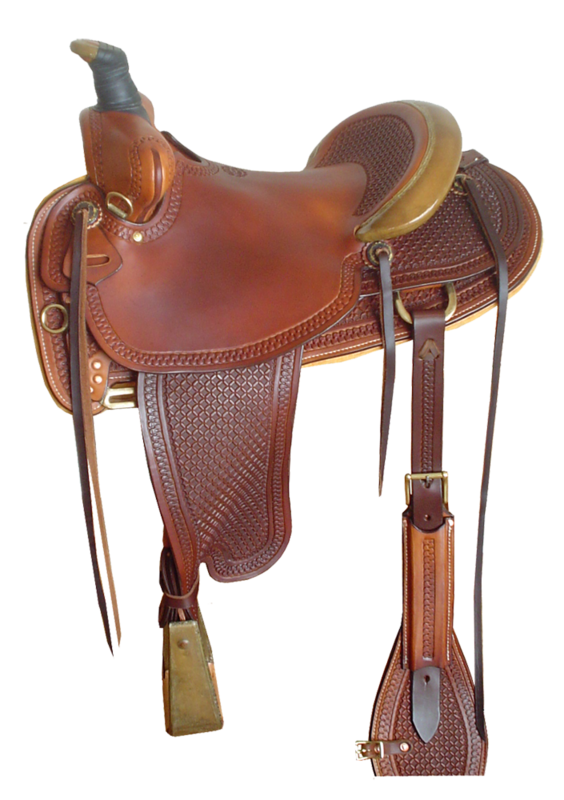 SPECIFICATIONS: Without a doubt the most important part of this saddle is that the tree, riggings and breast collar were designed with the Tennessee Walking Horse in mind. Russet Wickett and Craig skirting leather, brown latigo and natural rawhide were used to create this classic slick fork. Jeremiah Watt barbed wire hardware was used throughout and complimented by a barbwire border. A combination of smooth and block stamped leather adds to the functionality and durability. 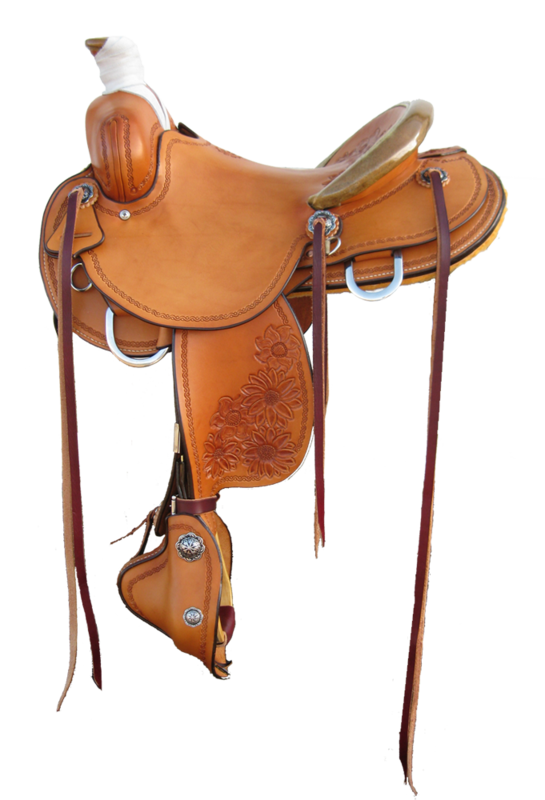 Tapaderos were added as this saddle will see plenty of brush, rain and snow at Bird Dog Field Trials in Illinois, Michigan, Wisconsin and Iowa. 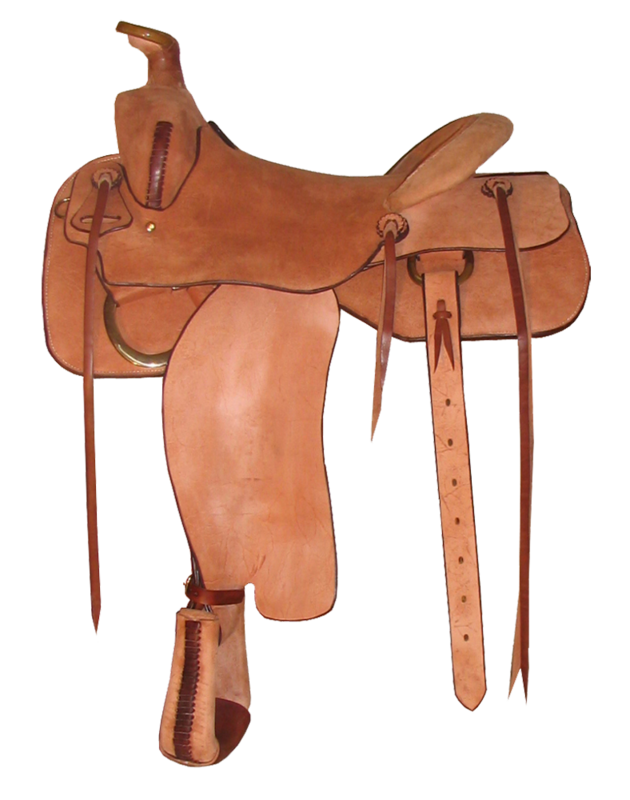 SPECIFICATIONS: Natural skirting leather and brown latigo, white rawhide horn, cantle binding, stirrups and swell front. 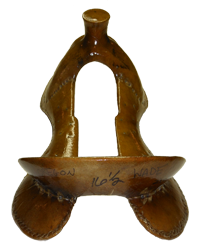 This saddle has a 2 3/4" high wood post horn with a 2 3/4" cap, and is wrapped with mule hide. Design features include hand carved Colorado Columbines on the fenders and swell forks and a serpentine cross border throughout. 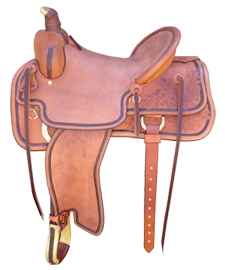 Bronze hardware hand made by Bork Saddlery Hardware was used for the rigging, breast collar and flank cinch.This saddle will be used by a Colorado veterinarian on his trail riding, hunting and packing exursions, including a 2012 trip on the Roundup Ride. 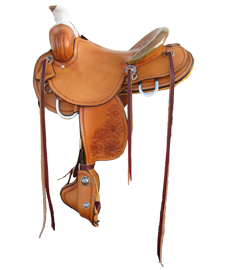 SPECIFICATIONS: Natural skirting leather and burgundy latigo, tapadero stirrup covers, natural rawhide horn and Cheyenne roll cantle binding. Tree has a pleasure horn. 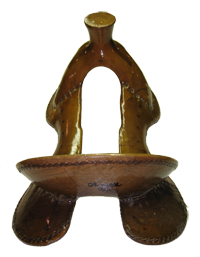 Design is a serpentine border with Daisy carvings on the stirrup fenders and seat dish. 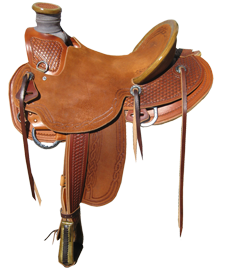 Hardware is stainless steel made by Bork Saddlery Hardware. 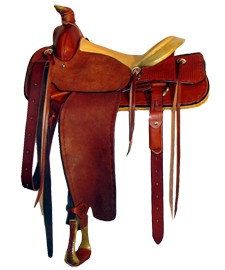 Included a matching 3-piece breast collar, flank cinch and saddle pockets. A longer set of matching stirrup leathers and fenders were made to replace these as the rider grows. 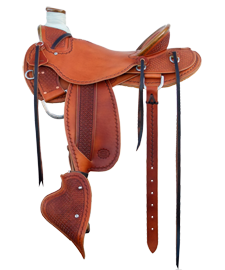 SPECIFICATIONS: Natural skirting leather and brown latigo, natural rawhide stirrup covers, horn and cantle bindings. Rough out seat and fenders with exposed stirrup leathers. 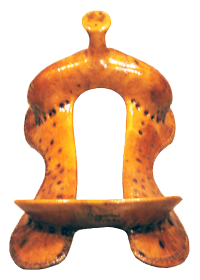 Tree has a wood post horn 3 1/2” high with a 3” cap. 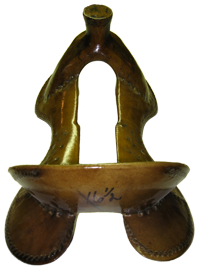 Design is a geometric Celtic knot pattern stamp on the stirrup leathers, swells and jockeys, and customers design Celtic carvings on the fenders, seat and horn cap. Hardware is stainless steel with a floral pattern made by Jeremiah Watt. Included matching pulling collar style breast collar, flank cinch and custom strung 100% mohair cinch. 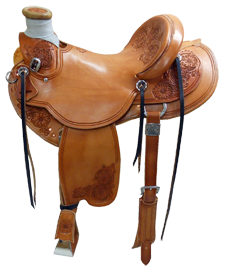 SPECIFICATIONS: Natural skirting leather and brown latigo, natural rawhide stirrup covers, horn binding and Cheyenne roll cantle binding. 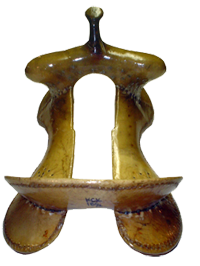 Tree has a 3 1/2” tall dally horn with a 1 1/2” cap and 13” swells. 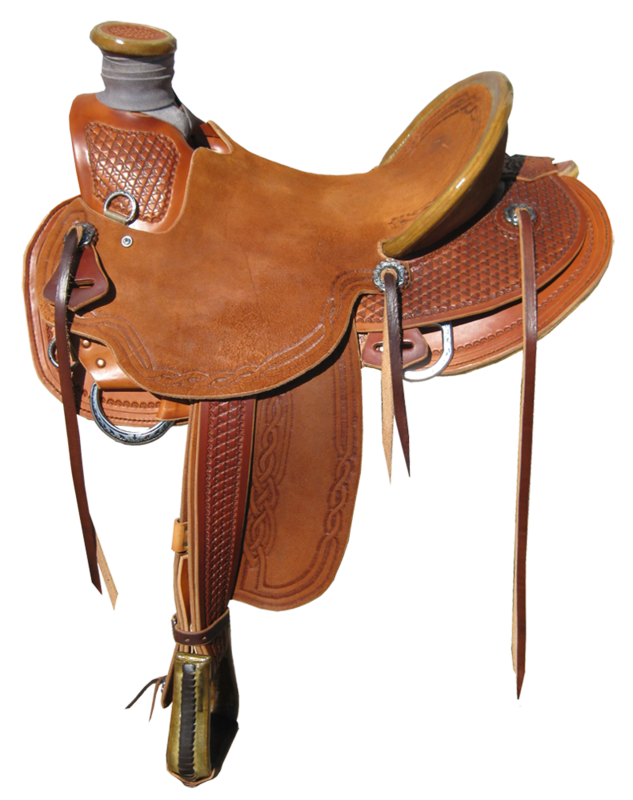 Design is a serpentine border and waffle stamp; fully tooled on the skirts, jockeys, fenders, rigging, flank cinch and partially tooled on the seat and swell cover. All parts are edge dyed brown. Hardware is solid brass Bork hardware, using a front 3 way flat plate rigging and 2 1/2” rear dees. Included matching breast collar, flank cinch and custom strung 100% mohair cinch. 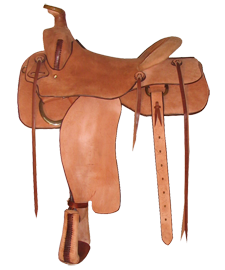 SPECIFICATIONS: Natural skirting leather and brown latigo, bleached rawhide stirrup covers and horn binding, leather cantle binding. Rough out seat and fenders. Tree has a 3 1/2" #9 ranch cutter horn with a 1 1/2" cap and 13" swells. Design is oak leaf carvings on the jockeys, skirts and breast collar. 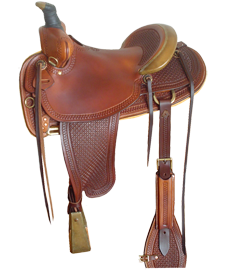 Also a pinstripe border painted brown is shared on the seat, fenders, jockeys and skirts. All parts are edge dyed brown. Hardware is solid brass Bork hardware; using front 3 1/2" rings and 2 1/2" rear dees. Including matching breast collar and flank cinch. 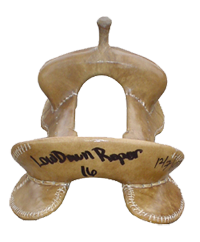 All oak leaf carvings are original compilations from many sources. 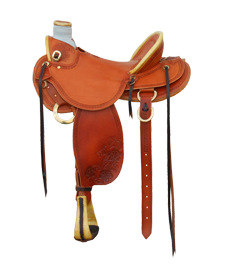 SPECIFICATIONS: Natural skirting leather and brown latigo, natural rawhide horn binding, leather stirrup covers and cantle binding. Entire saddle is rough out. Tree has a 3 1/2" tall post dally horn with a 2 1/2" cap and 12 1/2" swells. Design is plain with all parts edge dyed brown. 'Bar R' brand is carved on the jockey shield. Hardware is solid brass Bork hardware; using a double dee rigging. Included matching pulling collar style breast collar and flank cinch. 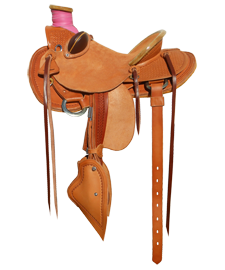 SPECIFICATIONS: Chestnut skirting leather and brown latigo, natural elk rawhide stirrup covers, horn binding and Cheyenne roll cantle binding. 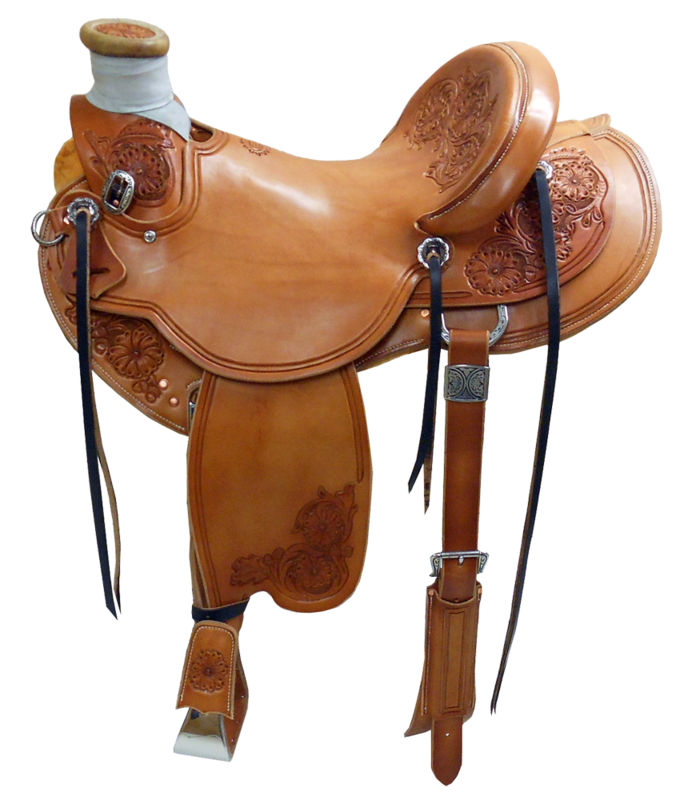 Rough out seat, jockeys and fenders with a doe tan padded smooth seat overlay. 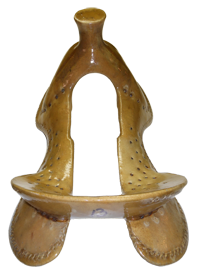 Tree has a 3 1/2" tall #4 post dally horn with a 2 1/2" cap and 12 1/2" swells. . Design is a barbed wire border on the fenders, skirts and jockeys. 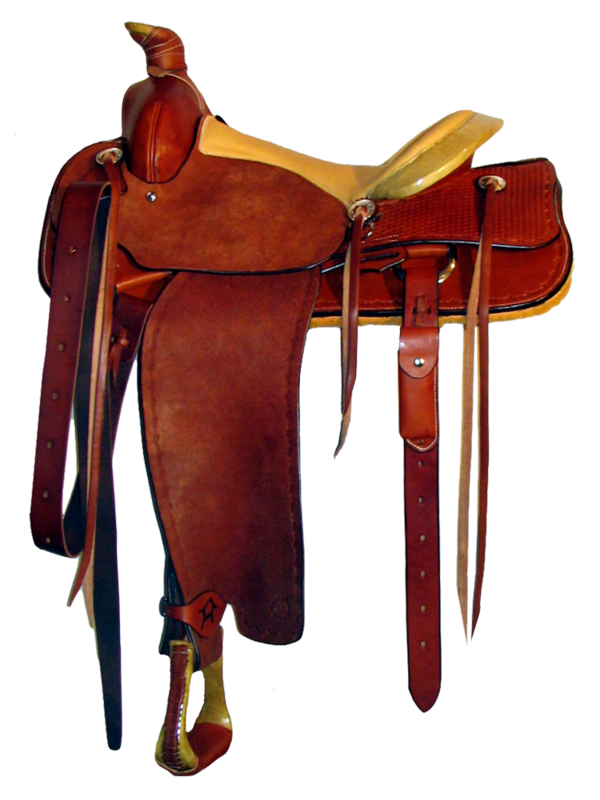 The Heyden Quarter Horse brand is carved on the jockey shield and stirrup hobbles. All parts are edge dyed brown. Hardware is stainless steel with a double dee rigging and a rope edge silver conchos. 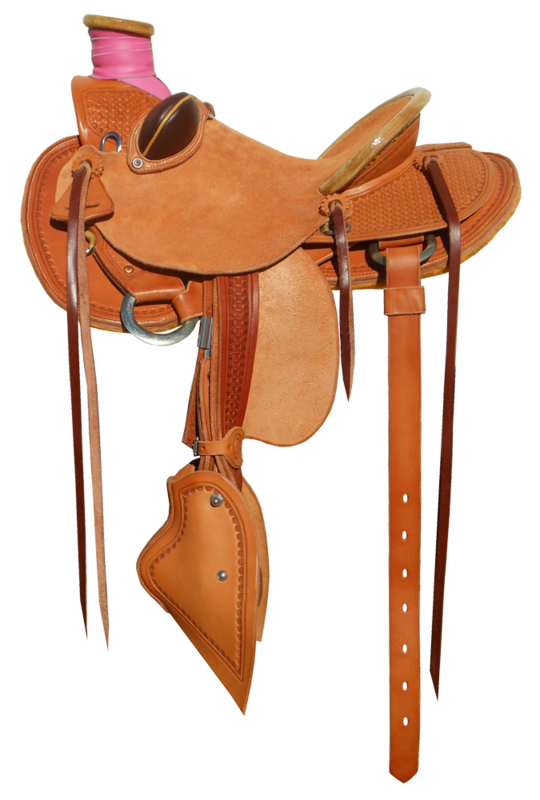 Included matching steer tripper breast collar, flank cinch and hoof pick case.